Paris has history bursting from every nook and cranny as you might imagine. 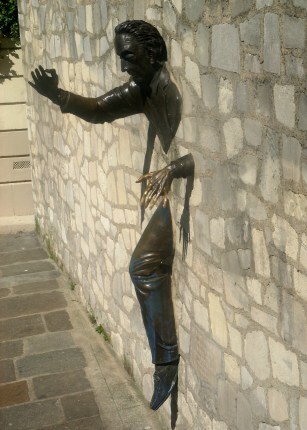 In Montmartre, we wandered down a side street and came upon this most remarkable sculpture. Before leaving home, I’d found and printed off a series of Internet pages of little “hidden places in Paris” and this was one of them. But I hadn’t remembered it was on Montmartre until we came upon it. That’s all there was to it – the piece mounted on a stone wall – a little square with a couple of benches – a tree beyond. The writer lived nearby until his death in 1967 and perhaps the little square was a favorite spot to sit and watch as people passed by – or a way station to rest before climbing the hill to the town square. Thanks, Valorie. I’ll have to put that on my “next time” list. Ah, Paris, la Belle Vie and Montmartre. What a wonderful surprise, this homage/statue. Reminds me of one of my own finds, la Musee de la Vie Romantique. It was the pied a terre, apartments of writer Georges Sands and her love children. A lovely albeit compact rose garden behind high stone walls where Georges and her lover, Chopin, spent many sunny hours in sheer adoration of love itself. Thanks for the moment to pause and recall. I breathe…deeply. Thanks! I thought it was too.